Welcome to James Clemens High School and Pre-AP or AP Biology! My name is Amy Haley, and I am so excited about the 2018-19 academic year! This is my third year at JCHS and my eighth year overall as an educator. I have a passion for science education and pledge to provide my students with every opportunity for success. 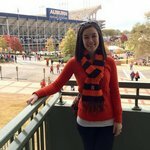 I graduated from Auburn University with a Bachelor of Science in Zoology in 2009 and a Master of Education in 2011. Science was my first love, and I hope to inspire an excitement for the subject in each of my students through hands-on activities, class simulations, and laboratory experiences! In my free time, I love to read and watch movies. I play golf (although not very well) and enjoy taking long road trips. I am also very interested in photography and the impact of fine arts on science education. Make sure to check out some of the photography in my classroom!